Electric or hydraulic driven. 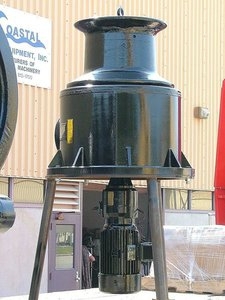 The BCM capstans can be directly incorporated into the deck structure with easily connection for motors from below deck. A ships capstan is a vertical rotating shaft machine used for winding lines and cables. It can be powered by electricity, hydraulics, pneumatics or gas. Capstans are usually located on the forecastle and poop decks for ready access during maneuvers. The different models vary in size and power. These devices are used for line handling during berthing and casting off maneuvers. Regardless of type, all capstans have two basic parts: the power source and the rotating shaft, also called the drum. In many cases, only the drum is visible, with the motor located below deck to reduce clutter. The characteristics of the lines and cables to be handled will determine the dimensions and the drum size. The power source, the power output and the location are other factors that must be taken into account.